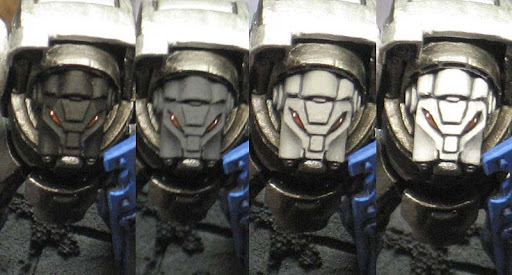 As promised, a step by step of how I painted the more important parts to the Storm Wardens Terminators. For me, the two key parts are the metal and the blue. These two colors make up the majority of the model. The rest of the stuff (bells and whistles) can be painted using your standard formulas however you like to do them. 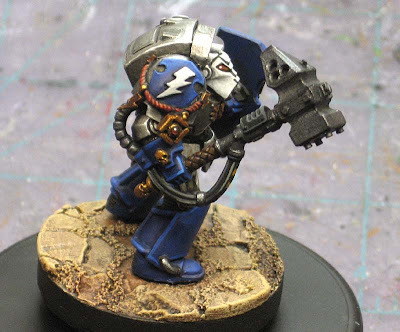 The metal and the blue are the Chapter colors and there was a general plan as to how they were to be painted between the members of the group. Not so much an actual painting plan as much as it we were all in agreement on what colors to use so all the units look similar. The metal parts were done with two colors. 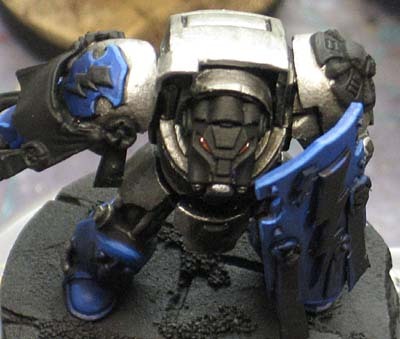 The armour starts as a silver and the weapons as more of a gunmetal color. All of it is washed with Badab Black and then I go back in and blend the base color in as the highlight. That way I get the brightness of the metal in places where the light would be hitting it. Using the same blues as everyone else, (GW Regal Blue for the base color and GW Enchanted Blue for the highlight) I started with my base color. I really like this blue and how it looks. With the base color down, I went in and applied a wash of GW Asurmen Blue to the recessed areas. Then I took the Enchanted Blue and blended it it as the first highlight. I opted to go this route because it matched the technique I used on the metal parts. 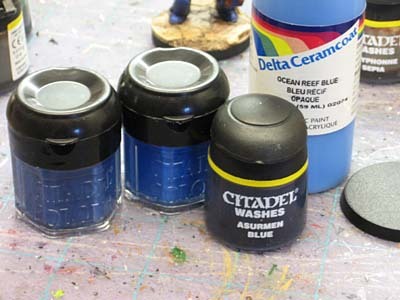 After I had my first highlight blended in, I dug through my selection of paints and found Ocean Reef Blue by Delta Ceramcoat and used it to line highlight just the upper portions of the model for that last little bit of contrast. It's not too far off from the Enchanted Blue and I think it makes the blue armour stand out a little bit. The helmets were made white to indicate Veteran status. I started with a dark grey, then layered a lighter grey on top of that leaving the darker shade visible in the recessed areas. 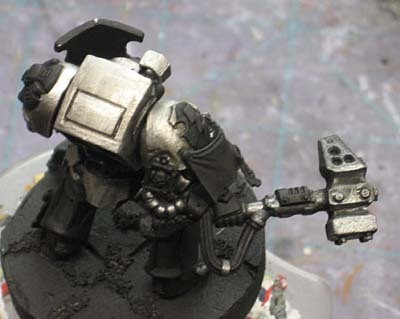 Then I went to white and layered it on leaving the recessed areas the darkest grey and actually leaving some of the light grey showing key spots to help with shading. The terminator crux was done similar to the helmets, but there is only the slightest touch of white on the top edge of the skull and bones to make them stand out a little bit and represent the overhead light source. With that stuff out of the way, it was just a matter of going in and painting all the little things like purity seals and such from that point on. I also really like how the colour of the base turned out. it's a perfect contrast to the blues and although reasonably uniform has enough of a highlight to add interest. I know I am very late on this topic but. 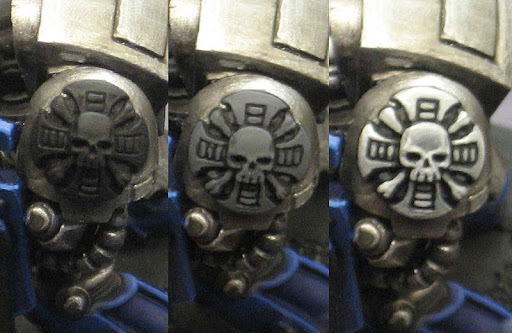 I am very interested in the paint used for the Crux and the Face. How did you achieve that "dry" look? Unknown: No problem, thanks for the question. Both elements are done the same way. Primed black and then basecoated with Delta Ceramcoat Storm Grey. The next step is done with Americana Slate Grey and that acts as the highlight on the crux and the next step towards white on the helmet. The Slate Grey on the crux is slightly thinned and added to the upper edges. A final thin highlight of white is done on the upper most edges of the crux and it's finished. The Slate Grey on the helmet covers most of the previous grey as it helps work our way up to white. The white goes over most of it as well and only leaves a hint of the Slate Grey showing in the recessed areas.